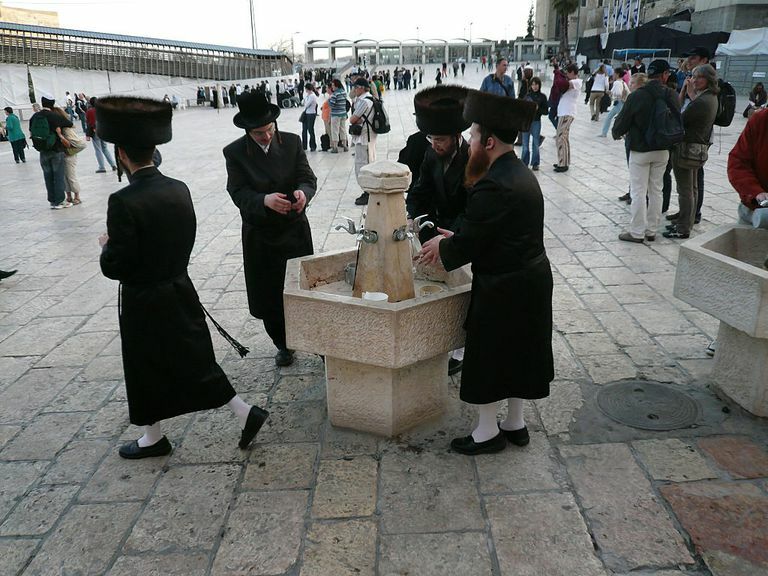 In Jewish custom, handwashing is more than good hygienic practice. Required before eating a meal at which bread is served, handwashing is a mainstay in the religious Jewish world beyond the dining room table. In Hebrew, handwashing is called netilyat yadayim (nun-tea-lot yuh-die-eem). In Yiddish-speaking communities, the ritual is known as negel vasser (nay-gull vase-ur), which means "nail water." Washing after a meal is known as mayim achronim (my-eem ach-ro-neem), which means "after waters." The basis for handwashing in Judaism was originally related to the Temple service and sacrifices, and it comes from the Torah in Exodus 17-21. And the Lord spoke to Moses, saying, "You shall also make a basin of bronze, and its pedestal also of bronze, to wash with; and you shall put it between the Tent of Meeting and the altar, and you shall put water in it. For Aaron and his sons shall wash there their hands and their feet. When they go into the Tent of Meeting, they shall wash with water, that they die not; or when they come near to the altar to minister, to burn offering made by fire to the Lord. So they shall wash their hands and their feet, that they die not; and it shall be a statute forever to them, to him and to his seed throughout their generations." The directions for a basin to be set up for the ritual washing of the priests' hands and feet is the first mention of the practice. In these verses, the failure to handwashing is tied to the possibility of death, and it is this reason that some believe that Aaron's sons died in Leviticus 10. After the destruction of the Temple, however, there was a change in the focus of handwashing. Without the ritual objects and processes of the sacrifices, and without sacrifices, the priests were no longer able to wash their hands. The rabbis, not wanting the handwashing ritual's importance to be forgotten at the time of the rebuilding of the (Third) Temple moved the sanctity of the Temple sacrifice to the dining room table, which became the modern-day mizbeach, or altar. With this change, the rabbis committed countless pages -- an entire tractate -- of the Talmud to the halachot (laws) of handwashing. Called Yadayim (hands), this tractate discusses the ritual of handwashing, how it's practiced, what water is considered clean, and so on. Netilyat yadayim (handwashing) can be found 345 times in the Talmud, including in Eruvin 21b, where a rabbi refuses to eat while in a prison house before he has had the chance to wash his hands. Our Rabbis taught: R. Akiba was once confined in a prison-house [By the Romans] and R. Joshua the grits-maker was attending on him. Every day, a certain quantity of water was brought in to him. On one occasion he was met by the prison keeper who said to him, "Your water to-day is rather much; do you perhaps require it for undermining the prison?" He poured out a half of it and handed to him the other half. When he came to R. Akiba the latter said to him, "Joshua, do you not know that I am an old man and my life depends on yours?" When the latter told him all that had happened [R. Akiba] said to him, "Give me some water to wash my hands." "It will not suffice for drinking," the other complained, "will it suffice for washing your hands?" "What can I do," the former replied: "when for [neglecting] the words of the Rabbis one deserves death? It is better that I myself should die than that I should transgress against the opinion of my colleagues" It was related that he tasted nothing until the other had brought him water wherewith to wash his hands. In addition to handwashing before a meal with bread, many religious Jews also wash after a meal, called mayim achronim, or after waters. The origins of this come from salt and the story of Sodom and Gomorrah. R. Judah the son of R. Hiyya said: Why did [the Rabbis] say that it was a bounden duty to wash the hands after the meal? Because of a certain salt of Sodom which makes the eyes blind. (Babylonian Talmud, Hullin 105b). This salt of Sodom was also used in the Temple spice service, so the priests were required to wash after handling it for fear of becoming blind. Although many do not observe the practice today because most Jews in the world do not cook or season with salt from Israel, let alone Sodom, there are those who hold that it is halacha (law) and that all Jews should practice in the ritual of mayim achronim. Mayim achronim has its own "how to," which is less involved than regular handwashing. For most types of handwashing, including before a meal where you'll be eating bread, you should follow the following steps. Make sure your hands are clean. This seems counterproductive, but remember that netilyat yadayim (handwashing) is not about cleanliness, but about ritual. Fill a washing cup with enough water for both of your hands. If you are left-handed, begin with your left hand. If you are right-handed, start with your right hand. Pour the water twice on your dominant hand and then twice on your other hand. Some pour three times, including Chabad Lubavitchers. Make sure the water covers your entire hand up to the wrist with each pour and separate your fingers so the water touches the whole of your hand. After washing, grab a towel and as you dry your hands recite the bracha (blessing): Baruch atah Adonai, Elohenu Melech Ha'Olam, asher kideshanu b'mitzvotav, vetzivanu al netilat yadayim. This blessing means, in English, Blessed are you Lord, our God, King of the universe, who has sanctified us with His commandments and commanded us regarding the washing of the hands. There are many who say the blessing before they dry their hands, too. After you wash your hands, before the blessing is said over the bread, try not to speak. Although this is a custom and not halacha (law), it is fairly standard in the religious Jewish community. Shavuot 101: Cheese, Late-Night Learning, and More! Are There Specific Rules Governing Shaving in Judaism? How Do You Pick the Right Bar Mitzvah Gift?